A rustic scarecrow looms before the skyline of Manhattan’s midtown skyscrapers. Under its watch lie more than 30 varieties of vegetables, fruits, flowers and herbs on a rooftop in Greenpoint, Brooklyn. But its real scarecrows, the overseers of this rooftop farming project, are Ben Flanner and Annie Novak. I asked if they’d had any problems with pest. “Lately, we’ve just begun getting some bugs. Both good and bad bugs. But even if they’re the bad ones, bugs are a good thing, because it means that they’re beginning to recognize that there’s an ecosystem here,” Novak replied. The bugs are taking notice, and hopefully the general public soon will, too. 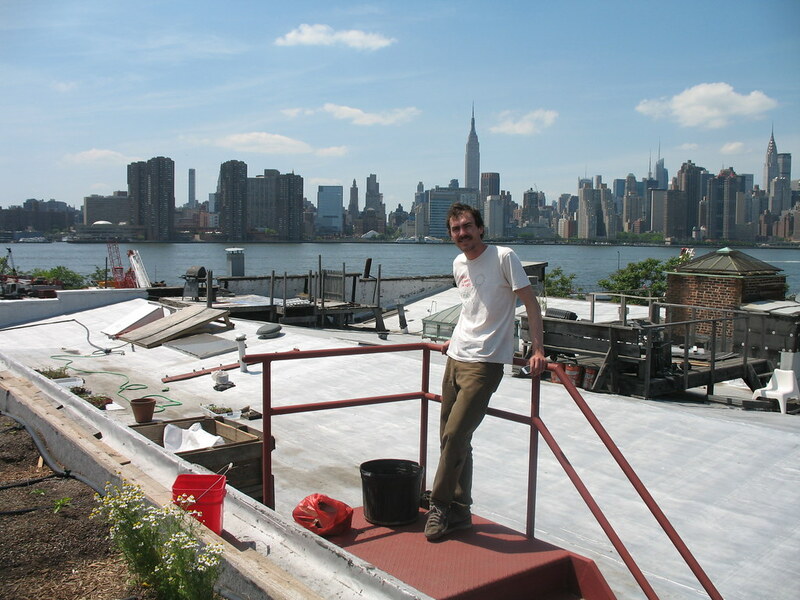 Similar in mission to the NY Sunworks Science Barge project, in which the nonprofit forged a viable ecosystem on a raft on the Hudson, Eagle Street Rooftop Farm is further proof that agriculture can thrive in the unlikeliest of places. 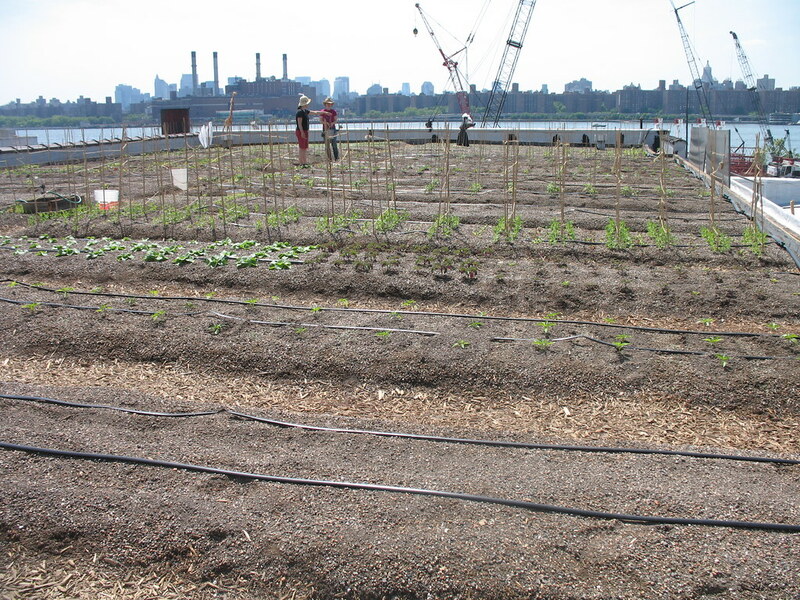 On top of an industrial building overlooking the East River, just a stone’s throw from the Pulaski Bridge, sits the 6,000 square foot urban farm. The farmers hired a crane to pour 150,000 pounds of soil onto the roof and created an irrigation system to distribute the wealth of water. A cache of seedlings ready to be transferred to the soil on the roof sits just adjacent to the rooftop, grown from seeds purchased from organic seed savers like Seed Savers Exchange. A beehive has been set on another neighboring rooftop, and on the day I visited the farm, so did a local beekeeper who was excited about lending her expertise to the project. There was talk of building a coop to hold ten or so chickens on the roof. All told, however, the directors cite a modest budget for starting their project. Last November, Ben Flanner read an article about Chris Goode in New York Magazine, and how he’d built several green rooftops in NYC, including his own in Soho. Then working in an office for eTrade, Flanner had been devouring books about farming all winter, and knew he’d wanted to do “something with it” that summer. The two mens’ dreams came together after Flanner contacted Goode about starting a rooftop gardening project. They eventually found an industrial warehouse on Eagle Street willing to host the rooftop farm. Owned by Broadway Stages, its cavernous interior is frequently rented by the film industry for movie sets. For a partner, Flanner was constantly referred to Annie Novak, a farmer with Kira Kenney of Evolutionary Organics. Both originally from the Midwest — Annie, from Chicago, and Ben from Milwaukee — the two were inspired by the urban farming activity there. “Chicago is a great place for apiaries,” said Novak, who estimates there are over 3,000 are present in the windy city. While Novak has had rigorous experience in farming and farm education (she is also a Children’s Gardening Program Coordinator at the New York Botanical Garden in the Bronx, school gardening programmer with Slow Food USA, and runs the workshop Growing Chefs), Ben cites no farming experience, “just passion.” He’d debated splitting his time between his office job and running the rooftop farm before quickly realizing the demands of the farm. 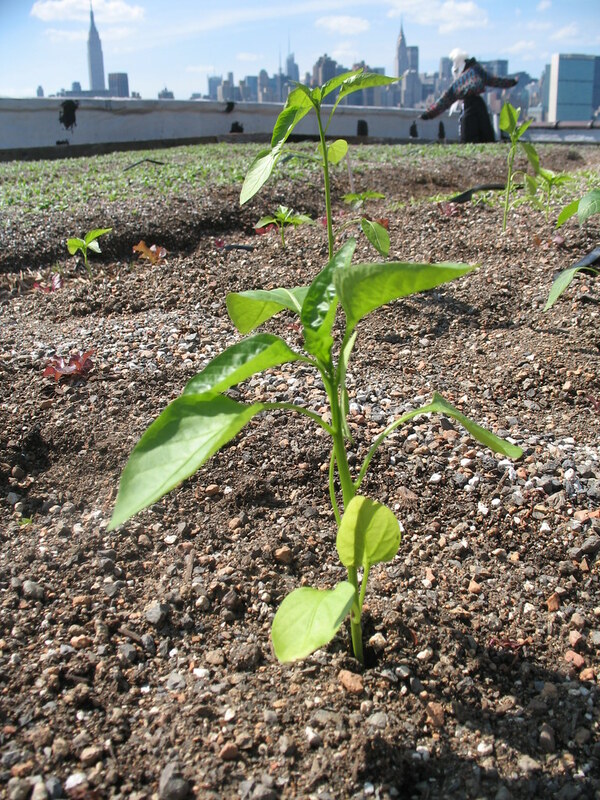 It was a sunny Memorial Day when I first stepped atop the rooftop farm. On it were two women who were volunteering that day, and throughout the next hour or so, several more volunteers would pop up. The rooftop’s crops were divided into two neat sets of rows about 100 feet long and 60 feet wide, with a wood chip-strewn walking path along the midsection and in between each row. The volunteers had just direct-sown radishes that morning. 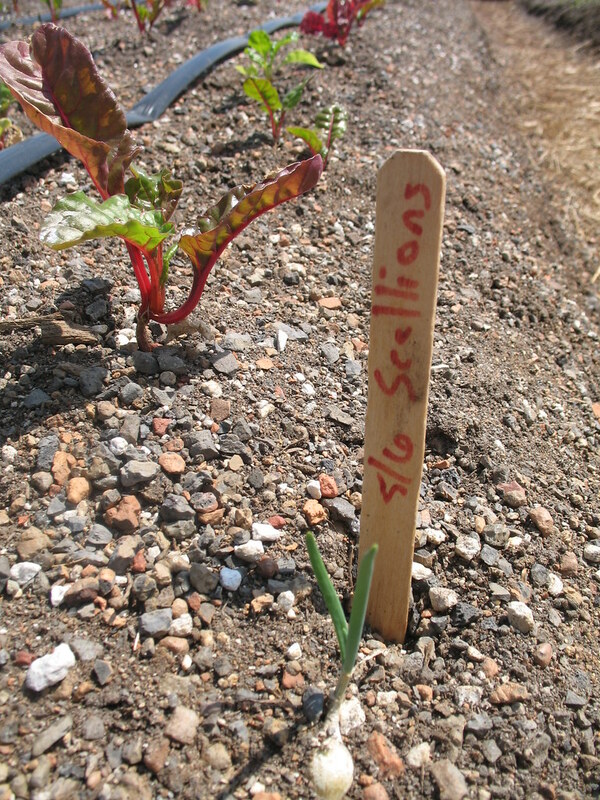 The directors estimate that close to 100 people have come through the farm to help out, going through one whole crop in a day, like radishes or scallions — many of which, according to popsicle stick-sized markers planted before each row, were only transplanted to the soil about one week ago. They looked almost ready to eat. Taking a languid break, the farmers discussed inter-cropping the lettuces with tomatoes, so that the tall tomato plants would provide shade for its neighboring crops. Or at least, that’s what I thought I heard. Novak answered my hapless question to clarify this point with a breathless explanation on the plants just at my feet: because lettuces are one of those plants that go to flower when it gets too hot, and going to flower early will spoil the harvest, the tomatoes are inter-cropped for shade, but that’s not the case with the pepper plants that are inter-cropped with the radishes over in the next row, they’ve been put in the same bed because radishes take 35 days to harvest while the peppers take much longer, so once they’re done new crops can be put in its place. “We want to teach as many people as possible,” said Novak, taking a seat along a bench of volunteers. Hence, my eyeballs needn’t have bulged with starry “teach-me” signs — this team is in it to educate. And without all the enormous response they’d received from various friends and volunteers, none of it could have been possible. In their call for volunteers last week, twenty people responded, out of the forty people on the email list. Both of the volunteers I chatted with had heard about the project at the Brooklyn Food Conference, too — Bruni Torras, who’d worked at Added Value farm in Red Hook last year, and Betsey McCall, who manages Murray Hill Greenmarket and teaches yoga. Learning how to grow plants can be intimidating for a lot of people, Annie observed, “because it’s a living thing and you can kill it. But just with experience you’ll get to watch how things grow,” she explained. Once they’re ready to harvest, the group plans to provide local restaurants and other community organizations with their crops. But only very local ones — they plan to transport everything they grow by bike. Nearby Greenpoint restaurants might be in luck, like Anella, where the group often picks up compost scraps from. The Eagle Street Rooftop Farm might also set up a stand for passer-by customers later in the summer. Ben plans on growing some hops for Sixpoint Brewery soon. At first, Novak admitted, she’d hoped the rooftop had been smaller. Now, she wishes it were 100 times bigger: “We could be growing so much more.” It’s all a learning experience, though. If it turns out to be that cabbage, for instance, is not a good crop for rooftop farms, then they’ll try other plants out for size. A diverse ecosystem is the first goal. And whatever crops flourish, they will find that they will; and those that don’t, that they don’t. Hopefully the lessons learned will become useful for later rooftop farmers. That is the ultimate goal of its founders, setting the mold for future rooftop farms to come. While we can all use more freshly grown produce in the city, the projects stands a testament that it can simply be done. For more info or to lend a hand, contact rooftopfarmer[at]gmail.com. as a organic grower of 10+ years and growing up inand around green house’s i have to say i am impressed with this project. but i wonder how they are draining the soil after watering. Soil needs a large amount of run off from watering to prevent nutrient lock. over time when there is no run off, the nutrients build up into salts and choke the plants to a slow death. or even quick one for that matter.. this is a wonderful idea. but poor drainage can result in a failed crop. i have seen this many times. what is the setup like? do they have the beds lifted? interesting to say the least. GOOD LUCK with this !!! i hope it turns out well..
Congratulations to a huge addition to the Brooklyn skyline! No mention was made in the blog about the structure of the building. It is important to note that a structural engineer should sign off that the additional weight of soil and water(!) do not jeopardize the structural stability of the building. I have been curious myself how some of these warehouses would hold up. In the design of new buildings, whether to green-roof or not to green-roof is always one of the first questions the structural engineer asks, and growing crops is a lot more water and soil than growing a thin later of moss or grass. It is great to see how people use the small spaces we have in such interesting ways. I can’t wait to watch how this project works out. We’d love to help and meet you. Yes, load is a serious concern. Not all buildings can handle the weight. You must evaulate the load-bearing capacity, and then ensure that it’s greater than the weight of the soil (fully saturated in water) + snow + additional buffer for live load (humans). This is an amazing idea. Wouldn’t it be so amazing in like 20 years when you fly out of JFK and see a green canopy over the city? Important questions: When choosing a location were there any concerns with the alleged toxicity of the air and soil in Greenpoint/Williamsburg and coming off of the Newtown Creek? Will you be studying the soil and plant quality you get? This is amazing to hear about because I live in GP, just blocks away from the farm! I’d love to volunteer! How can I get in touch with these folks? I want to do this to my roof in Bedstuy so bad. how deep is the soil? What are the layers down to the roof top? Where does the water go after it travels passed the roots through the soil? This is revolutionary. Thanks for being optimists and idealists. This is really super! We have been farming on 3000 sq ft area in the city of Mumbai, India and our work can be viewed on the blog. Every time one sees such news reviews it just strengthens our resolve to spread the message and the technique to more and more people. It will be nice to keep in touch and exchange our success and failures! My name is Doug DeCandia. I am graduating this week from college where I am receiving my degree in sustainable agriculture. I am from the lower Hudson Valley, NY and am moving home to begin farming. 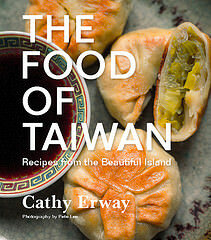 I am very interested in food production initiative in NYC and taking part in it as well. I am curious if you all had any information that you could share. I love how you put it. Great stuff. Hello could I use a few of the insight found in this website if I supply a link back again to your site? Having bugs is a good sign indeed. Getting rid og them is not on the first place. post reminds me of myy goood old room mate! He always kept talking about this.